The 2016 Sogeti IoT Hackathon is a global event of inspiration, imagination and innovation bringing together a passionate community of technologists and practitioners from around the world to design and create novel IoT-based experiences and intelligent systems that have real-world application and market potential. The IoT Hackathon starts in August and runs through October taking teams through a three-month journey of human-centered design, creative engineering, problem solving, and team building. The Hackathon will lead off with a Design Thinking component for ideation toward a build out of prototyping end-to-end IoT solutions. The objective is for teams to produce full working solutions that can be readily leveraged for sales demos and POCs for prospects and clients. The IoT Hackathon will be conducted on a global basis with US units in different cities participating as well as involvement from colleagues in Europe and India. Using Design Thinking challenges, participants will leverage the Internet of Things as a ubiquitous computing ecosystem in which intelligent systems can be designed, developed and deployed using sensor devices to collect, communicate and crunch data in order to perfect and predict some aspects about a future, better world centered on these themes. These platforms provide a comprehensive set of capabilities to connect IoT devices, communicate device data to IoT event hubs, and deliver real-time as well as predictive analytics to mobile and backoffice visualization user interfaces. 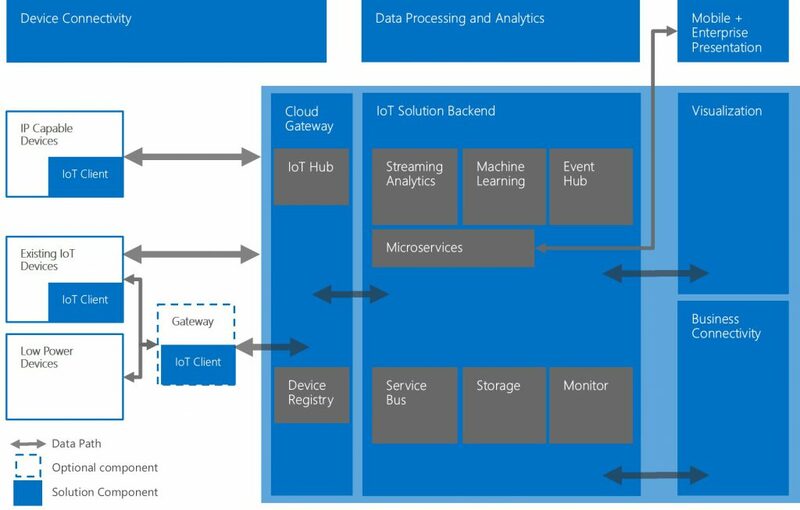 A base reference architecture will serve as a foundation for solutions created on the Microsoft Azure IoT, Covisint IoT, and IBM Watson IoT platforms. The purpose to include these three platforms is to demonstrate IoT capabilities using Microsoft Azure, Amazon AWS, and IBM Bluemix as well as showcase alliance partner IoT offerings. The base reference architecture will provide readily usable assets that can be modified to suit the IoT ideation and prototyping. Platform-based assets and IoT devices that can be used in prototyping will be distributed to hackathon teams. The IoT Hackathon will also incorporate a maker aspect to construction by enabling teams to build custom hardware modules into their IoT designs. Maker components will demonstrate how IoT systems can be enhanced to take on real world interactions in contexts where additional sensor data can deliver new insights and experiences. This maker experience also goes beyond using IoT simulators and shows capability for integrating real-time embedded software into third-party hardware sensors to open up creative possibilities. IoT Hackathon teams will be asked to develop a PowerPoint pitch describing their IoT innovation. A cross-industry panel of judges will review these pitches to then request a demo. Prizes will be awarded to the teams with the top five IoT innovations. The solutions developed via the IoT Hackathon will serve as a basis for innovation lab events for Sogeti clients and prospects. The IoT solutions will also be available for briefings and demos at CapGemini Sogeti’s Applied Innovation Exchange in San Francisco. The innovation labs will present the Design Thinking spaces and the IoT solution architecture to deliver deep insights and practical implementation knowledge to accelerate client time-to-market. The Sogeti IoT Hackathon is produced by Sogeti USA and SogetiLabs with the help of these sponsors.